Nothing conjures up autumn like old-fashioned caramel apples. Homemade caramel apples make great budget party treats, and making them is an activity even the kids will enjoy. Once you have your caramel made, use this simple recipe to make an inexpensive treat to share throughout the fall holidays. Remove the stems by using tin snips or twist the stems off by hand. Insert the sticks into the apples. Set one apple on one of the lined cookie sheets and carefully grasp a skewer with the point facing away from you. Place the point on one end of the apple core (either one will do!) and slowly press the stick into the apple. Use a small cloth to pad your hand, if needed. You can press the stick completely through the core but, by stopping short of the other end, you slow oxidation to the core, making the apple last longer. Repeat for each of the remaining apples. Prepare a pot of melted caramel. Cover the apples with the caramel. Grasp the end of the skewer and, while allowing the apple to rest in the pot of warm caramel, spoon caramel over the apple until it’s coated. 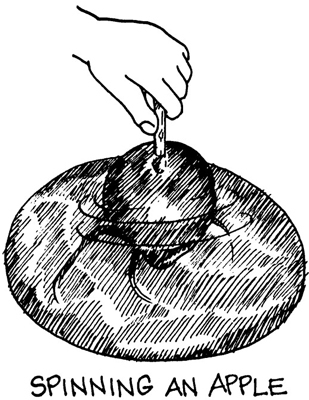 Then lift the apple out of the caramel, but still keep it within the confines of the pot; gently roll the skewer between your fingertips, spinning the excess caramel back into the pot. Don’t spin too hard because you can spin caramel out of the pot and make a mess. Place the apple on the lined cookie sheet. Spin the skewer between your fingers to remove excess caramel from the apple. Coat the caramel-coated apples with toppings of your choice, if desired. Place your toppings in a small bowl that’s big enough to hold about 2 cups of topping with room to roll the apple. Roll the apple into the coating, and hold the apple by the stick over the bowl, allowing the excess toppings to drop off. Place the apples on wax paper and allow the coating to set for about 10 minutes. This item has a fairly short life because the combination of the extreme heat and the core’s being skewered contribute to a shorter life. Store your caramel apples uncovered on the counter for four to five days.